Have you ever wondered where the phrase, “cool as a cucumber” comes from? Cucumbers are cool to the touch, and the insides can remain approximately 11 degrees cooler than the surrounding air because a cucumber is 96% water. Though cucumber is often considered a vegetable, it’s actually a fruit, and there are hundreds of varieties, which fall into two categories: pickling and slicing. According to World’s Healthiest Foods, cucumbers have important phytonutrients with valuable antioxidant, anti-inflammatory, and anti-cancer benefits. Many of these nutrients are in the skin and seeds of the fruit. 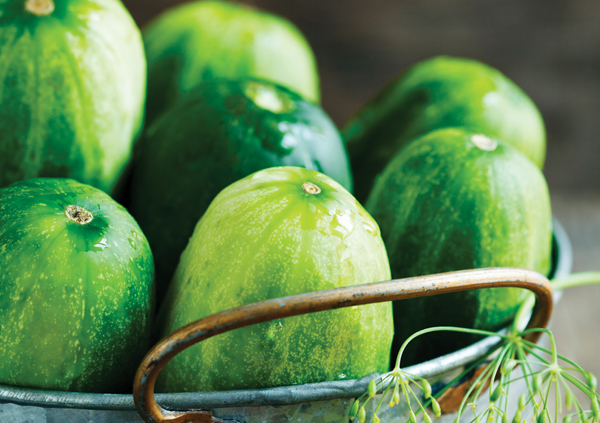 Cucumbers are also very waistline friendly—a one cup serving of cucumbers has a mere sixteen calories! When choosing cucumbers in your grocery store or farmer’s market, look for fruit that is firm and unwrinkled, with medium to dark green skin. Cucumbers are sensitive to heat, which can cause them to wilt and become limp, so be sure to store them in the refrigerator. This recipe is inspired by our frequent visits to a favorite sushi restaurant, which serves a cool and spicy cucumber salad. To seed a cucumber, split it in half lengthwise and scoop out the seeds and the pulpy matter with a teaspoon or melon baller. Cut the cucumber halves crosswise into half moons ¼ inch thick. Place in a colander, sprinkle with 1 teaspoon of the salt and toss together. Set aside to drain for 1 hour. Pat the cucumbers dry. In a small saucepan over medium heat, combine the sugar, the remaining 1 teaspoon of salt and the vinegar. Heat until the sugar and salt dissolve, about 2 minutes. Remove from the heat and let cool. To assemble the salad, in a large bowl, stir together the salted cucumbers, shallots and red pepper flakes or sliced red jalapeño. Pour the vinegar mixture over the cucumbers and toss well. Garnish with the cilantro leaves. Marinate the cucumbers for at least 1 hour before serving. Recipe adapted from The Williams-Sonoma Cookbook, edited by Chuck Williams (Free Press, 2008). This light and refreshing appetizer combines salty, spicy, sour and sweet elements. *Jicama can be substituted for melon, and provides a wonderful crunchiness. To prepare the melon, cut it in half. Scoop out and discard the seeds. Cut the rind away from the flesh, and then cut the flesh into long spears. To prepare the mangoes, hold a mango on one of its narrow edges, with the stem facing you. Position a sharp knife just to the right of the stem end and cut downward, running your knife as close to the pit as possible. Repeat on the opposite side of the pit. Using a paring knife, peel away the skin from each mango “cheek,” then slice the flesh into long spears. 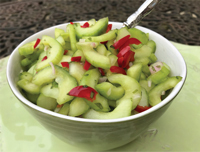 Place the melon, mango, and cucumber spears in a large bowl. Sprinkle the juice of ½ lime over the fruits, then add the salt and chile powder, and toss to coat evenly. Taste and adjust seasonings. Serve the spears upright in glasses so that people can pick them up with their fingers. Alternatively, cut the spears into cubes and serve in a bowl with toothpicks. Serve with lime halves for squeezing on juice as desired. Recipe adapted from the cookbook, Tacolicious, by Sara Deseran. *Ginger ale can be substituted with agave nectar and club soda if desired. Add ½ ounce (1 tablespoon) of agave nectar to the shaker, and top off the drink with club soda or sparkling mineral water. Place vodka, lime juice, mint leaves and cucumber slices in a shaker with a few pieces of ice. Shake until very cold and strain into a tall glass filled ¾ with ice and a few slices or one spear of cucumber. Top off with ginger ale; stir gently to blend. 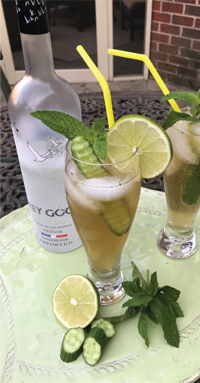 Garnish each glass with a sprig of mint and a slice of lime. For a mocktail, make it without the vodka—it’s still delicious and refreshing!